UK husband and wife team Steve and Viv Muir have just fulfilled a long-held ambition to set up a gin micro-distillery (NB Distillery Ltd) in their home town of North Berwick to produce their own brand of handcrafted premium gin. NB Gin has been made from pure British grain spirit and a combination of seven botanicals. The gin is stilled, blended, bottled and labelled by hand in North Berwick in small batches. The still was custom built in London. NB Gin was launched this month at Lockett Bros in North Berwick, and there are plans to expand to other stockists as demand grows. It has already been snapped up by Vino Wines, Royal Mile Whiskies and Drinkmonger, and it’s being trialled at the bar in Edinburgh’s Harvey Nichols store, and Juniper, a new bar on Edinburgh’s Princes Street. In addition, it’s being sold, served or trialled at a number of shops, bars, hotels and restaurants in East Lothian. As part of their product development process, Steve and Viv engaged the services of Charles Maxwell at Thames Distillers in London, whose family has been distilling gin for more than 300 years. 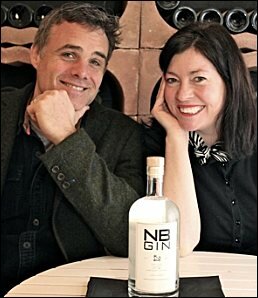 Together with his head of quality control, Gema Zaragoza, they agreed to be part of the official tasting committee for NB Gin and concluded that it was “a fine gin that was extremely likeable”. High praise indeed from the industry experts, and a fantastic endorsement from a company that produces more than 40 gins for 30 brands.